Don’t you just love the grilling season? I love the way that grilling your food brings you outside for dinner…once you’re standing out on the deck flipping chicken or veggies on the grill, you may as well set the picnic table and eat dinner outside! No heating up your kitchen with the oven, either. The only drawback to grilling season is that it can be easy to fall into a sort of a rut. Using the same barbecue sauce or marinade can eventually get boring, so it’s nice to shake things up with some different flavors. I found this recipe for Yogurt Marinaded Chicken at Bon Appetite, and I’m excited to have it in the summer grill rotation! The yogurt does a great job of tenderizing the chicken, and the tangy flavor blends perfectly with lemon or lime, Greek spices, garlic and sweet onion. It’s a fresh, flavorful way to spice up grilled chicken! A few cups of plain organic yogurt (we make ours at home) is the base for this zesty marinade. Add some chopped onion, garlic, fresh cilantro, olive oil and lime or lemon juice. The spices give this marinade a distinctly Mediterranean flavor, with ginger and garam masala (or use cumin, coriander, and cinnamon). Pound some organic, free range chicken breasts flat (or butterfly them) and toss them into the marinade and allow it to rest overnight. Then, a few minutes on the grill and you’ve got a wonderful, moist and flavorful centerpiece to your dinner! Greek lemon rice and sauteed Brussels sprouts pair perfectly with this meal, and an ice-cold slice of fresh watermelon is heavenly for dessert. Light, flavorful and so healthy! 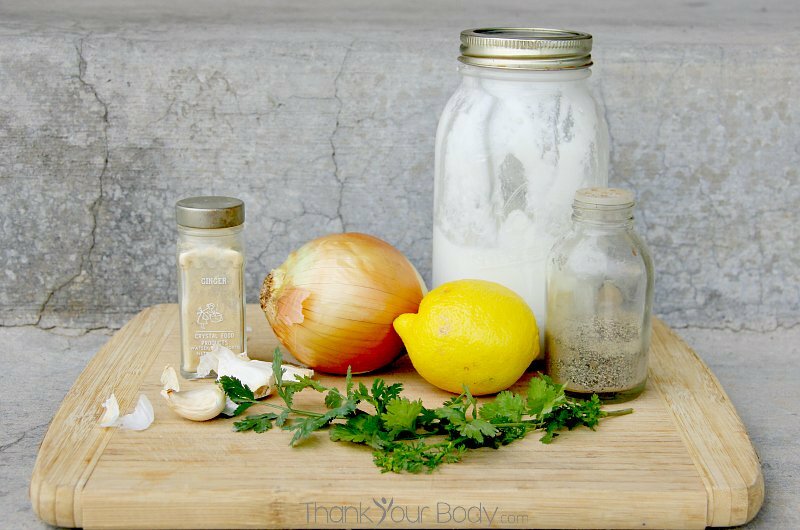 Shake things up with this delicious and easy yogurt marinade next time you look to grill some chicken. Prepare the chicken by placing it between two sheets of wax paper and pounding it to ½ inch thickness, or butterfly the chicken so that it's ½ inch thick. Put the chicken into a large zip lock bag. In a food processor, combine the rest of the ingredients and blend well. Pour the marinade over the chicken and seal the bag well, place in the fridge for at least 3 hours (overnight works well). Over medium-high heat, grill the chicken 3-4 minutes per side. What’s your favorite marinade for grilling?